In order to look at the roof of the house from all sides, and all the roof elements were protected, it must be carefully trimmed. One of these "cosmetic" operations is filing the overhangs of the roof. It will give both the roof and the house itself the necessary completeness, and at the same time it will give additional protection. Then - in more detail about what constitutes such a filing, what materials it requires and how it is performed. The lower part of the roof protruding beyond the level of the walls of a house is called the overhang. It protects the foundation and walls from rain. Its width can vary from 40 centimeters to a meter. 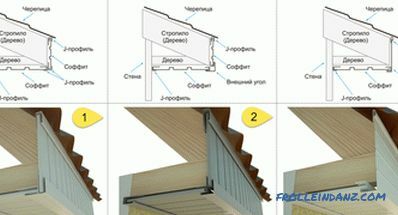 In principle, according to the rules of construction it is not at all necessary to produce a binder for this part of the building. However, this may cause some trouble. For example, a strong wind, crept sideways under the roof unprotected by the overhang, can simply disrupt the roof covering. Yes, and I want to hide the inside of the roof, along with all the layers of its "pie" - waterproofing, insulation and an ugly lower part of the rafter. According to the rules hem roof after all the installation of the roof. Also, before this, insulation of all exterior walls of the house and their finishing should be carried out. That is, filing is a kind of final stage of construction and exterior decoration of your home. There are two types of overhangs - horizontal, they are also called eaves and gable. The cornice overhang is formed by the lower part of the pitched roof, and the gable overhangs are inclined overhangs formed by the side of the slope. It makes up the lower part of the sloping roof, facilitating the passage of air into the attic. This is typical for garret-type roofs. But at the mansard roofs, the air goes over the overhang through the overhang of the "roofing pie" - to the place where the air gap is. Then the air continues on its way up to the ridge. 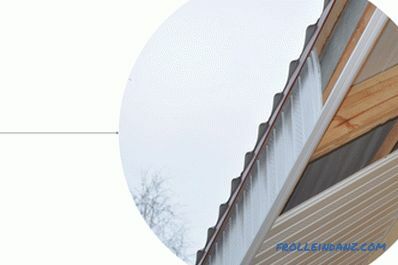 This is how the roof ventilation works. Now imagine that the overhang will be tightly packed, for example, with boards. It will be bad - ventilation will not be carried out. However, if the filing of the roof is not done at all, then under the roof will be able to crawl mice, fly birds or insects. Rafters will need to be protected with paint, or fog and moisture will damage them. Warning! From all of the above, we conclude that the filing of the cornice overhang should be done not dense, but ventilated. The most elementary option is to leave a gap between the wall of the building and the binder. 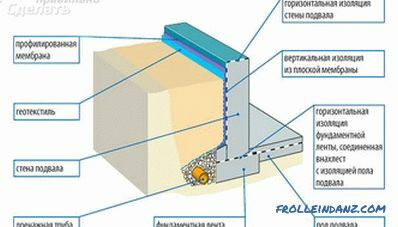 If profiled sheeting is used for filing, then this gap should be from 0.6 to 1.2 centimeters, for lining or siding - from 1 to 1.5 centimeters. For such options for filing roof eaves, such as metal sheets, slabs or lining, you can use ready-made ventilation grilles that are mounted into the material. If the overhang is sheathed with boards, for ventilation, gaps are made between them, from half a centimeter to centimeter. Using spotlights, you can apply perforated material created specifically for this purpose. Rule No. 1. In terms of volume, ventilation openings may not be less than one five hundredth part of the entire area for ventilation. At the same time, a roof based on bitumen, as well as a seam type, requires a larger diameter of these holes than clay roofing. After all, the latter still "breathes." Rule No. 2. All ventilation openings should be covered with grills. If it is a gap, then use the grid. Such a measure will protect them from dirt, leaves, insects and birds. It is formed by the side of the slope, which is located at an angle. There is no need to worry about ventilation, but you should take care of proper protection from wind and moisture. Otherwise, a strong wind, blowing gusts, can drive rain between the battens, which protrude outside. And this is serious, as it can get wet insulation, ceasing to keep warm well. Warning! Therefore, when working with finishing the gable overhang, the tightness comes to the fore. 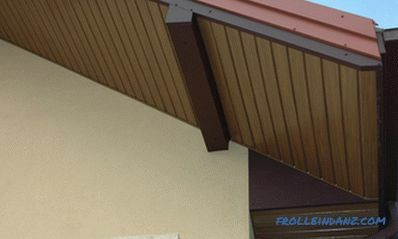 Example of a gable overhang. Both types of overhang have unclosed elements at the ends. At the eaves overhang this is the end part of the rafters, and for the gable overhang - the ends of the sheathing. It is necessary to arrange them carefully, while protecting from the weather. In addition, the eaves overhang require installation along the gutters of the drain. 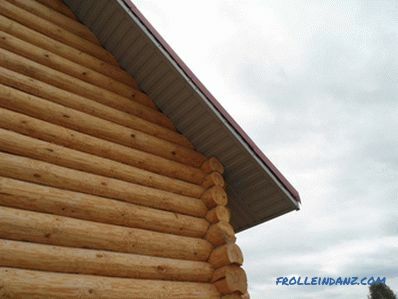 In general, the finish of the overhang is the edge trim. And from what to do it, depends on the roofing material that you applied. By the way, often complete with a roof covering is already available and a set for registration and sewing of the edge. 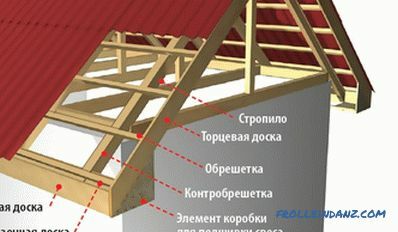 Before stitching the eaves of the roof, it is necessary to cut vertically, in one line, all protruding rafters or fillies. Cut them to be strictly at the same distance from the wall. Then the ends of the rafters combine strapping board, which is nailed frontal board (usually metal). The front board is usually complete with metal, ceramic and bitumen tiles. This part is made of wood covered with paint or paint for protection. It is on this board that gutters are subsequently mounted. 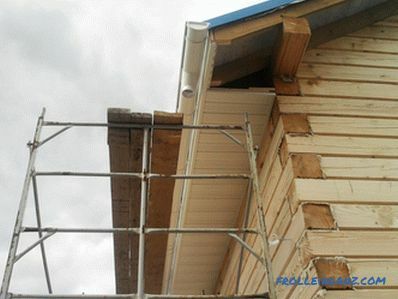 The gable overhang is treated as follows. First, trim the crate boards protruding from the wall. The cutting line must be parallel to this wall. 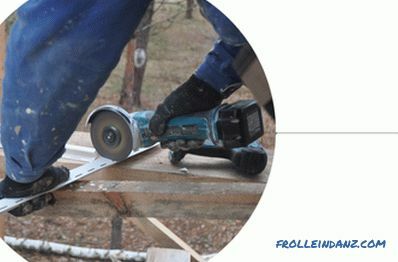 The end board (wooden or metal) is nailed to the cut edges of the sheathing and to the end of the skate beam. 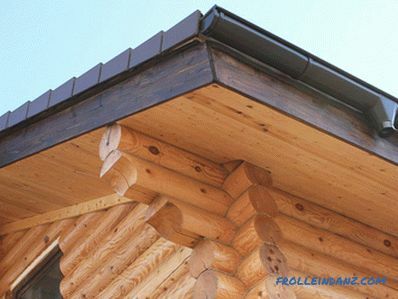 The material for the roof, the length equal to the length of the eaves, cover the end of the board. The variety of options for filing roof overhangs is large. This can be done perpendicularly and parallel to the overhang, use whole sheets or individual strips, use different materials and parts fastening structures. However, in fact, there are only two filing technologies. This is probably the easiest. The main thing is that the plane at the lower ends of the rafters be common. This method is suitable primarily for roofs with a small slope, no more than 30 degrees, and the removal of no more than 40 - 50 centimeters. Hem on the crate made of boards or bars and bolted to the rafters. The lining slats can be arranged parallel to the wall, along the end of the rafters, and it can also be filled perpendicular to the plane of the rafters. It is indispensable when the slope of the roof is steep. At the same time installation passes quickly, and material is significantly saved. For work, it is necessary to build a so-called box from the bars by attaching it to the wall and to the rafters (above and below). In order for water to fall on an overhang, it could easily drain, a bar located on the rafters should be one centimeter below the wall beam. From the corners of the roof to the corners of the house nail the boards. When the overhang is more than 45 centimeters, you need another longitudinal beam in the middle. The remaining longitudinal bars reinforced bars, stuffing them perpendicular to the wall. Example of mounting of the batten for horizontal covering of the overhang. 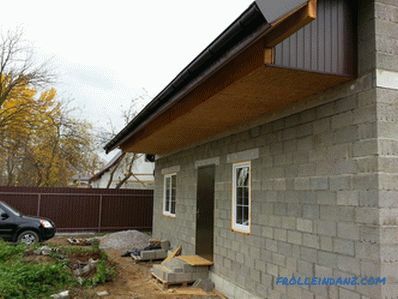 At the same time, we do not pay attention to the way of filing the eaves overhang. Straight to the crate attached timber or boards. To these bars or boards running along the gable, the sheathing panels are attached. When choosing a material for covering the overhang, you need to match this with the style of the house. Agree - the roof binder with white plastic will not look particularly aesthetically pleasing if the house is wooden, and even dark. 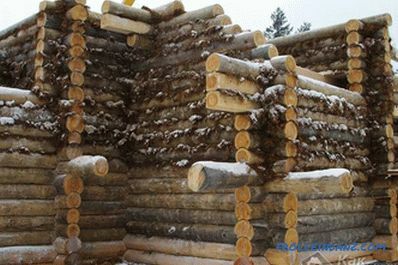 Better to take softwood boards, with a width of 5 to 25 centimeters, and a thickness of 1.7 to 2.2 centimeters. Before installation, treatment with antiseptic, varnish or paint. Before work, you must give the board a month to lie on the street under a canopy - otherwise, if it is too dry or wet, then it will warp. Sheeting overhang, between the boards make a gap in a centimeter or one and a half for ventilation. 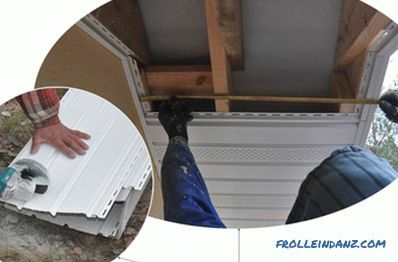 When installing boards perpendicular to their walls, they are fixed on both sides (if the overhang is wide, then in third place - in the center of the board). If the boards are mounted parallel to the walls, fix them through each meter. 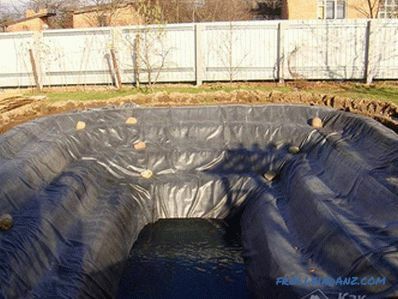 It is inexpensive, from $ 120 per cubic meter, or from $ 2.2 per square meter. This material is good because it has already been processed (unlike boards), and therefore it is in great demand. For covering the overhang, you need to take moisture-resistant lining, designed to work in these conditions. Like the board, this material should also be held outdoors for a month before installation. Installation methods are the same as for the board, only the slits do not need to be left. Instead, use ready-made grilles for ventilation, at a distance of 1.5 meters from each other. Cost - from $ 6 per square meter. For binding, you need siding that is protected from moisture. All the necessary items are purchased with it: these are strips in the form of the letter “P” for finishing the edge, and corners for fixing the joints of the planks, and grilles for ventilation. They are mounted perpendicular to the walls, holding them in two, three or four places. The number of attachment points depends on how wide the overhang is. 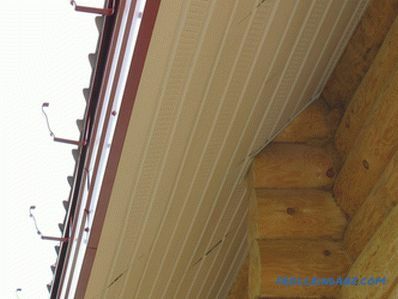 It is not recommended to fasten PVC panels along the roof overhang as it is not as hard as wooden planks and requires a large number of fasteners and can sag. 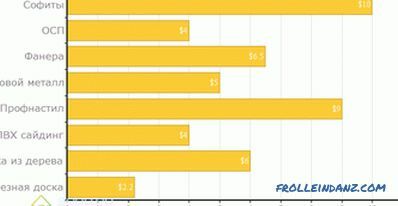 Cost - from $ 4 per square meter. This material is easy to install - after all, it can be laid in large planes and fixed with the same distance as the board. Its profile height can be from 0.8 to 2 centimeters. 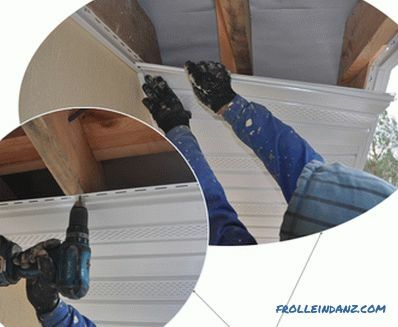 When filing the overhangs of the roof with a professional sheet, a gap of 0.6 to 1.2 centimeters is left (depending on the temperature expansion). Ventilation is done using special gratings. Cost - from $ 9 per square meter. This can be galvanized or polymer coated steel, as well as aluminum or copper. Sheet thickness - from 0.6 to 0.8 millimeters, and length - up to 6 meters. For ventilation, you can either grille ready to insert, or perforated pieces of sheets. Where the cutting line passes, the steel sheets are treated against corrosion (for aluminum and copper, this is not necessary). The disadvantage of using such materials is that a special tool is needed for cutting. Cost - from $ 5 per square meter. For filing of overhangs, take brands of materials that are waterproof. These plates are quite rigid, you can mount in large pieces. 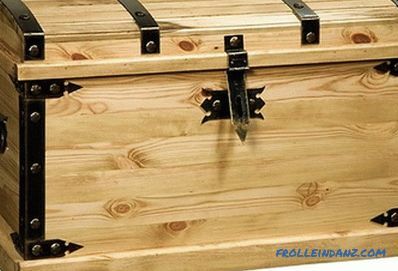 To do this, make a box of wooden bars - the plate is screwed to it. Attach them every 1 - 1.2 meters. For ventilation cut grilles ready. The overhang of this material will definitely need to be painted, otherwise it does not look very beautiful. Plywood costs about $ 6.5 per square meter, OSB is about 2 times cheaper. 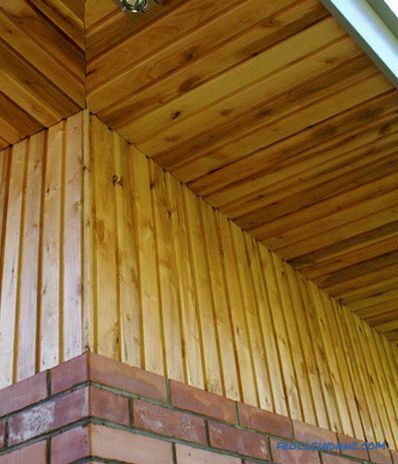 Soffits are strips produced specifically for filing overhangs. They can be made from a variety of materials. 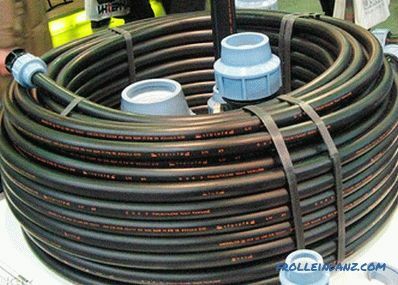 In particular, from such as PVC, steel, copper, aluminum. Having a large palette of colors and different textures, spotlights can be matched to the design of any home. 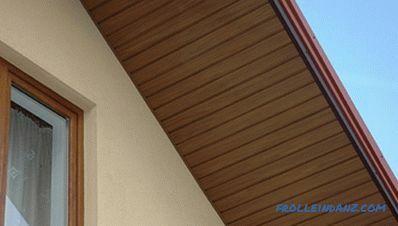 The appearance of the soffit and additional elements may vary depending on the manufacturer and material of manufacture. Sofit panels are triple, double and single, solid (for the gables) and perforated (for the eaves). It should be noted that filing the overhangs of the roof with a soffit greatly simplifies the work. It does not require the involvement of experienced builders - and you can handle yourself. Cut the strips according to the width of the overhang and fix them perpendicular to the walls on the profiles with grooves - that's the whole trick of installation. PVC strips cost from $ 10- $ 12 per square meter, and mounting strips and chamfers cost 5 times less. 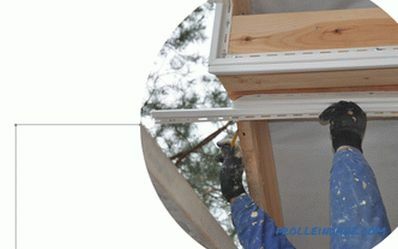 Depending on the manufacturer and the material for the manufacture of soffits and additional elements, the rules for installing soffits may differ. Therefore, always check with the manufacturer's instructions. In this case, the filing of the roof overhangs using vinyl spotlights will be considered. Most often installation of soffits is done horizontally, although in some cases they are also used for mounting along rafter legs. For horizontal mounting, a special obreshetka is made, as described above or in the video instructions below. Then all the necessary elements are attached to this crate. 1. To begin with, a J-profile of the required size is measured, for this, a profile is applied across the overhang and a label is applied. 2. You can cut the profile to size with the help of the "grinder", everything is cut quickly, and the cut remains even. 3. After that, the profile is attached to the wooden frame with screws. 4. After all the profiles are fixed, measure the distance between the two profiles in order to find out the size of the soffit strip. After that, slit strips of the required size are cut. 5. To install the plank, it is slid first into the wall, and then into the eaves overhang and fixed with screws to the wooden crate. 6. If the J-chamfer is not used when filing, then the frontal part of the overhang is also sewn up with soffits. For more information about mounting battens and spotlights, see the video below.